Today’s data centers need to be characterized not just by their agility but also best practices that help managers operate with maximum efficiency, while keeping costs under control. While organizations are continuously struggling to cope with data processing and storage demands, budgetary concerns are possibly the major hurdle to overcome. This not only includes the cost of the physical space required but also the energy consumption. This is where data center management software can come to the rescue. As far back as 2010, the Uptime Institute had predicted that the market for data center infrastructure management (DCIM) solutions would grow from $500 million in 2010 to $7.5 billion by 2020. And having crossed more than the half way mark to 2020, businesses have quickly realized that they could save hundreds of thousands of dollars that would otherwise be spent on operational and energy costs if only they would use DCIM software. James Hamilton, VP and Distinguished Engineer at Amazon Web Services, calculated monthly costs of power to be $474,208 (http://perspectives.mvdirona.com/2010/09/overall-data-center-costs/). Even a 5% savings could quickly add up to over $280,000/year of savings, which easily makes the case for implementing DCIM software. This is the most basic level, where the IT operations within the business are simply “trying to survive day-to-day crises.” At this level, management processes are primarily focused on specific incidents, which are addressed manually to a large extent. Management tools are also largely device specific, although a few enterprise-class tools might be used with little or, at times, no automation. The key processes at this level include incident management, inventory management, access and control and service desk. Although day-to-day operational issues continue to take precedence at this level, some processes now are documented and replicable. Management tools are utilized by entire departments; however, these are usually only for the measurement of IT performance in terms of SLA requirements. The key processes at this level include asset management, space management, change and configuration management, problem management and job scheduling. This is the level where the service organization becomes a consistent and fundamental interface to the larger business. According to the EMA model, “Management processes are still primarily problem driven, but are more easily remediated with procedures in place for root cause identification. This constitutes a shift away from reactive incident management toward problem prevention.” Management tools, at this level, become automated and integrated into the various managed environments, providing real-time alerts and other measurements to assess IT health. The processes include visual modeling, capacity planning, root cause analysis and workload automation. This is the most mature level of data center management, where everyday issues are managed largely via automation, such that IT can concentrate on enhancing business advantage and optimizing the infrastructure in a way that dynamically responds to changing business conditions. Therefore, management tools at this stage offer detailed data to support infrastructure decisions to improve both the agility and profitability of the business. The management processes here include responsible autonomics, dynamic service provisioning, analytic reporting and management and hypothetical modeling. 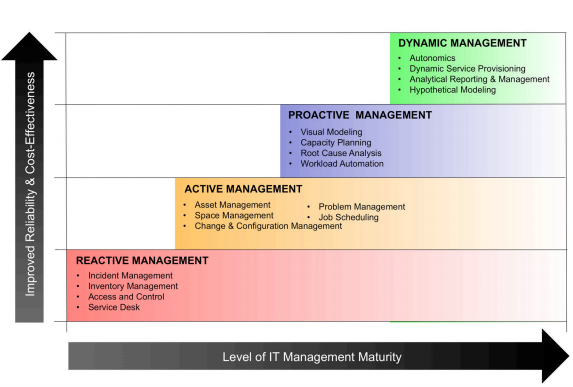 According to the EMA Maturity Model, the highest level “dramatically improves change management by helping to determine which organizations and data center elements will be affected by the change event so accurate deployment workflows can be created.” Combining the EMA model with DCIM can save you a great deal of money and resources all while achieving a higher level of effectiveness and efficiency in your data center. If you’d like to learn more about how and what DCIM should be monitoring in order to reduce costs, please check out our whitepaper on how to ensure your monitoring does what you need it to do.